Are you ready to rip out your tired old bathroom? As you plan your bathroom remodel, your head is likely spinning with ideas. No matter what size your bathroom is, your dream bathroom is within reach. We have put together a set of considerations and inspiration for you to draw upon as you start to work out your plans. Even the smallest bathroom can be made to feel open and spacious with the right touches. Before you plan, the bathroom must be measured and the location all of the pipes and electrical wiring accounted for. If the plumbing or wiring is out of date these may have to be replaced. Moving any fixtures such as the sink or shower would also require extra plumbing work. It is important to choose a colour scheme for your bathroom in the planning phase. Be sure to read our guide to choosing a colour palette for the home for tips. The bathroom is a very tactile room, and using the right materials not only adds a level of comfort but pleases all the other senses. The material of choice for bathroom floors are stone, porcelain or ceramic tiling. Tile can be uniform, and a part of the floor can also include a patterned accent to create a more artistic feel. You can also mix and match the size of your tile for a more organic look. In general, it is suggested that the scheme of the floor is subtle so as not to draw the eye downwards. The right countertop surfaces can add a touch of class to any bathroom without breaking the bank. Granite and Marble countertops are not only sleek but add to the resale value of your home. They don’t accumulate grout and will resist wear and tear. Laminate and tile are more economical options, and laminate is versatile in that it comes in many colours and styles. Laminate can even be made to resemble stone or marble. However, these options require more care and won’t stand the test of time quite as well. 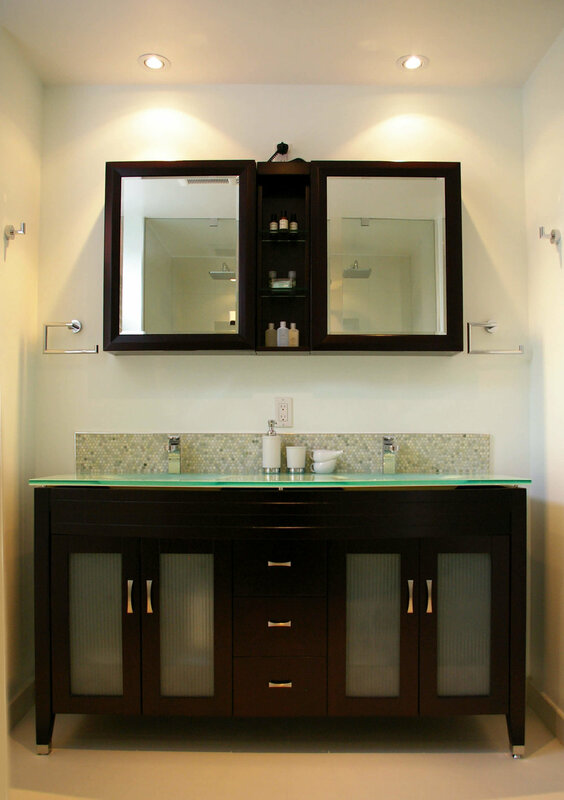 Your vanity and cabinets can be both storage and stylish, contributing to the overall feel of the bathroom. Whatever width or depth you have available to you, there are options to create a nuanced style that reflects your personality. Minimalist design is still trendy in fixtures. White, ebony or gray vanities and cabinets are a clean look that can work amidst any colour scheme. Many homeowners are now also opting for vanities that have open-bottom shelving. Floating vanities are also an option that works well in a particularly small bathroom. Those opting for a natural and unique look can install a vanity and cabinet combo made out of reclaimed wood. Your choice of a sink will say a lot about who you are as a person. Round or square? Large or small? Undercounter or vessel? Traditional or modern? Ceramic or marble? There is a sink for every style. Faucet-type is also a consideration here. Sink faucets can be tall and imposing, or small and unobtrusive. Depending on your setup you may be able to opt for wall-mounted faucets. Faucets and their handles can be classic or modern and can be made out of pretty much any metal under the sun. For accessibility and older homeowners, you may even want to install motion-activated faucets. Your tub or shower is often the focal point of a bathroom and a place to soothe and unwind. It’s important to create a space where you will feel at peace with features that will provide you comfort. Many homeowners choose to ditch the tub for a walk-in shower. However, if you enjoy a good bath there are plenty of tub/shower combo or tub only options. Of course, you could also decide to upgrade to a hot tub. Walk-in showers come in many flavours as well. A glass door adds the illusion of more space in the bathroom and allows guests to appreciate the work you put into it. Even if your bathroom is particularly small, you can still go walk-in by adding a quarter-round shower in the corner. Your shower wall tiling can play with colour or provide colour accents to your space in an otherwise neutral-themed bathroom. Ceramic or porcelain tiles come in many varieties and are more cost-effective, but stone or marble add an extra layer of elegance. Adding recessed shelving opens up space in the shower, and a recessed bench can add a level of luxury and accessibility. You may also want to consider accessibility concerns when choosing your shower faucet. A great way to improve the overall feeling of calm in the bathroom is to improve your lighting. Where possible, adding windows or expanding current windows is a great way to start the day with a healthy dose of natural light. For your fixtures, you will have to consider the ceiling, vanity lighting, and for a larger bathroom also in the shower and tub area. The general rule is to avoid a ceiling light right above someone who would be using the vanity as it provides an unflattering reflection! Instead, make sure a ceiling light would be behind someone grooming themselves. Top and side lighting around a vanity mirror will also provide a proper light profile for using the mirror. Just ensure you don’t overdo the brightness! For a spa-like feel, you can also wire your lights so you can install a dimmer switch. At Bryant Renovations, we have been designing and executing bathroom renovations since 1986. Our team of boutique renovation experts will work with you and the contractors throughout the entire build to ensure everything goes according to plan. To get a quote on your dream bathroom renovation, reach out to us today.